If you have a question or concern about your Social Security System (SSS) account, it’s best to contact the SSS directly to get accurate answers to your queries. In this short guide, we will discuss the SSS hotline numbers and SSS contact numbers that you can use to reach the agency. While Google and some websites offer plenty of information regarding your SSS account, sometimes it’s not sufficient. Calling SSS customer service will most likely answer your question or help solve your SSS-related problem because you’re getting information from the agency itself. You will get updated and accurate information about your SSS concerns such as contributions, benefits, loans, and other transactions. In the past, the SSS hotline was available for only 16 hours per day but it was later extended to 24 hours per day. This means that you can even call them at midnight and an agent will promptly assist you. The best and quickest way to contact the SSS is to call them via their hotline numbers. You can call them any time of the day from 7:00 AM on Mondays to 7:00 PM on Saturdays. The SSS call center is closed on Sundays and public holidays. Before calling, be ready with your SSS number because the customer service agent will need it to check your records. If you don’t know or you forgot your SSS number, the agent will ask for verification such as your complete name, mother’s maiden name, and home address. The Interactive Voice Response System (IVRS) is an automated system that assists you with your SSS-related concerns. Members have to follow the computerized voice instructions to get answers to their basic questions. 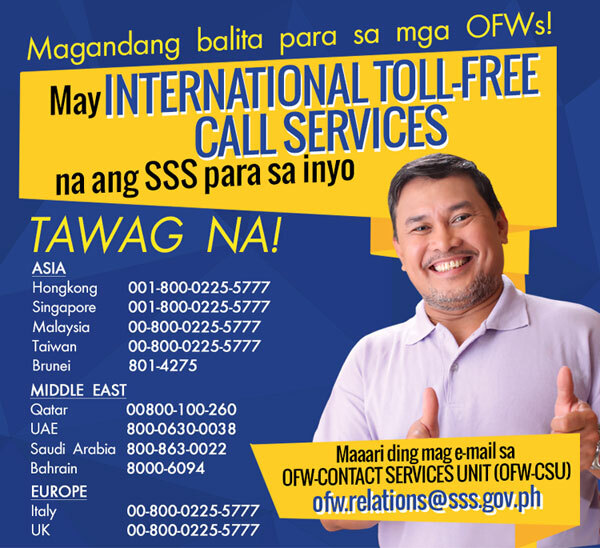 Overseas Filipino workers (OFWs) and Filipinos abroad can now call the SSS through their international toll-free numbers. At the moment, the service is available to only a few countries in Asia, the Middle East and Europe. 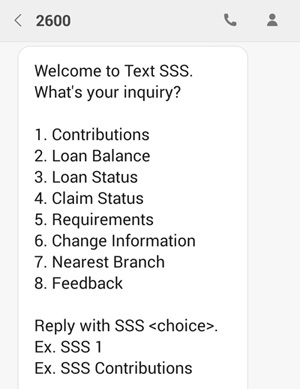 You can send an SMS or text message to inquire about your SSS contributions, loan balance, loan status, claim status, membership requirements, or to know your nearest SSS branch. Simply text SSS to 2600 and follow the instructions in the text message you will receive. Each text message costs P2.50. You may need to register by texting SSS REG <SS Number> <Date of Birth MM/DD/YYYY> to 2600. For example: SSS REG 1234567890 04/03/1981. 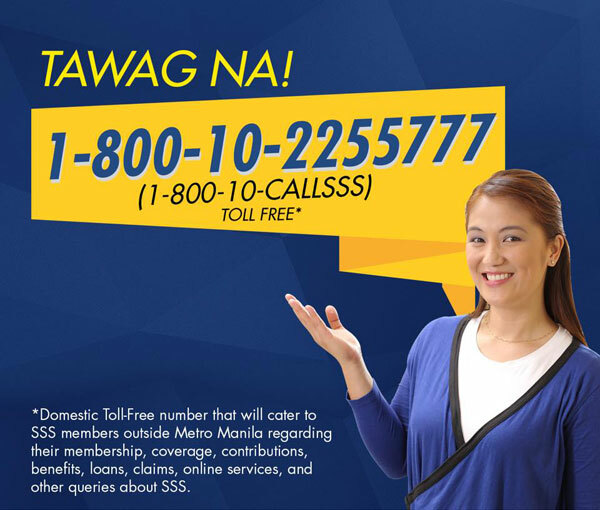 If you don’t want to call or text, you can send SSS an email or a direct message on their social media accounts. We hope that this handy guide will be of use whenever you need help with your SSS account or membership. Take note that some information might change without prior notice, so if a particular number is not working, then most likely it has been replaced. We’ll make sure to update this guide from time to time whenever a change is announced by the SSS. If you have any questions or clarifications about this guide, please don’t hesitate to comment below.